Microsoft Ignite is running from Monday 24th until Friday 28th in Orlando, Florida, next week. Here’s how I plan to consume from this conference. There are two answers to this question, depending on what you mean by the question. Why would I care to consume content from Ignite? That’s simple – Ignite is a cornerstone event in the Microsoft calendar for techies. If you work with business software from Microsoft, then this is when the big stuff gets announced, and this is the best opportunity to learn from the product groups. Even as an MVP, I have a unique opportunity to interact and learn from product groups, but they focus a huge amount of effort on this particular week. The breadth of content is huge – over 1000 sessions covering almost every aspect of enterprise software from Microsoft. In this era of constant change, it’s foolish not to try to keep up. The real question should be – why would I not want to learn at Ignite? As for the second interpretation of the question: why attend Ignite when every session will be live streamed and available to download within 48 hours? The realities of life are that if I’m around at the office, or even working from home, the phone will ring, the email will ping, and I won’t get a chance to focus on the content. I have a young family, and at night, they come first. Attending the conference gives me a chance to focus. It’s a few days away, but the value carries over for at least the next year, and beyond. I always take lots of notes at Ignite – long-time readers of my blog know this because my notes are posts on this site. I open Live Writer and start typing as the speakers are talking. You’d be amazed how often I end up googling my own articles! If you’re not a blogger, then I’d recommend opening OneNote and taking notes for each session. If work sent you, consider sharing the notebook with your colleagues. If you’re part of a team that is attending, then cerate a shared notebook, split up and attend different sessions – you’ll exponentially grow the organisational learning and value from the conference. I don’t get any real value from the opening keynote. It’s all too airy-fairy and marketing speak for the general news media. For me, the meat starts immediately after the opening keynote. For the last few years, there have been “breakout keynotes” straight after the Satya Nadella session. That’s when the likes of Jeff Woolsey (Windows Server) and Scott Guthrie (Azure) flood us with news and features. As with the last few years, I will be attending lots of Azure sessions. And if it’s like last year, almost every session will have additional announcements. There’s no “how to” learning here, it’s more of a “what’s possible” learning experience – I can figure out the “how to” at home once I know what to look for. To be honest, “how to” learning doesn’t work when there’s only 60-75 minutes and you cannot do hands-on. I typically only attend the 75 minute breakout sessions. Scattered about the hallways and expo hall are the theatre sessions, which are where most of the non-Microsoft speakers are talking. These are typically 10 minute sessions. There’s some value here, but the nuggets are so small, and the timing doesn’t work for me – this is the sort of thing I can get from a blog post or a YouTube/Channel 9 video. But that’s not true for everyone – some of the theatre sessions had massive crowds last year – bigger than many of the breakouts. My calendar is filled out with breakout sessions, but I often change my planning based on my gut feel for what’s being presented. Sometimes a track is dull, sometimes the same speakers are doing the same content 3-4 times but with different session titles, sometimes I hear of something exciting that I didn’t expect, and sometimes I hear about a great session that filled out but is being repeated. When I first attended TechEd Europe, one of the best learning experiences I had was in the hands-on labs (HOLs). This gives you a chance to try things out in a sandbox environment. I haven’t done this in years, but I could be tempted to try out some AI, data, or Kubernetes labs if there are any. I’ve got friends in this business that I only ever see at conferences. MVP Kevin Greene only lives 20-30 minutes from our house but I see him a handful of times per year – we have pretty full family/work lives. I enjoy meeting up with Kev, Damian Flynn, ex-MVP and now Azure CAT John McCabe, and a bunch of other MVP and Microsoft friends that I’ve met over the years, and even some folks that I know over social media. There’s plenty of opportunity to be social at Ignite. Tuesday is party night (watch out for invitations), but most evenings Microsoft has a “mini-party” in the expo hall – which is also a great place to learn. And of course, there’s the conference closing party on Thursday night in Universal – the Hogwarts ride is pretty cool, Spiderman is fun, and Hulk looks damned scary (it would make me puke but my eldest daughter did it 4 times in a row) – Rip Ride Rocket looks worse! I will be easy to identify. 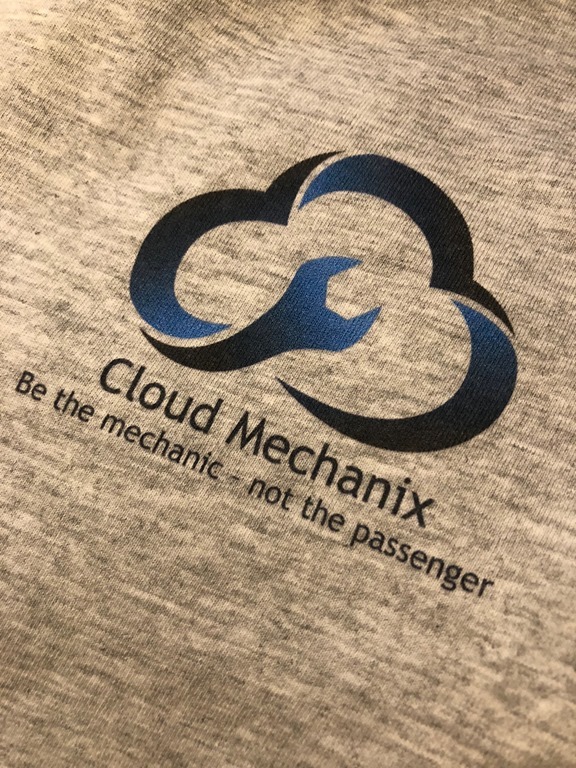 I’ll be wearing a Cloud Mechanix T-Shirt.